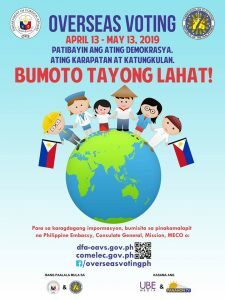 Berlin – Philippine Ambassador to Germany Maria Cleofe R. Natividad reported to the Department that on 13 May 2013 the Embassy closed the voting period at 1:00 pm Berlin time in accordance to COMELEC rules that the overseas voting end by 7 p.m. Philippine time. Among those that came to the Embassy on the last voting day was Ms. Carolyn Medel-Anonuevo, who works for the Hamburg-based UNESCO Institute for Lifelong Learning. Ms. Anonuevo said that she preferred to stay overnight in Berlin so that she can cast her ballot in person at the Embassy.